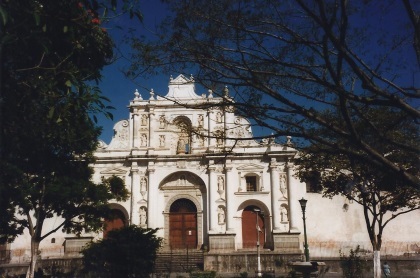 Antigua Guatemala is known for its Spanish colonial architecture. Antigua was founded in the early 16th century. 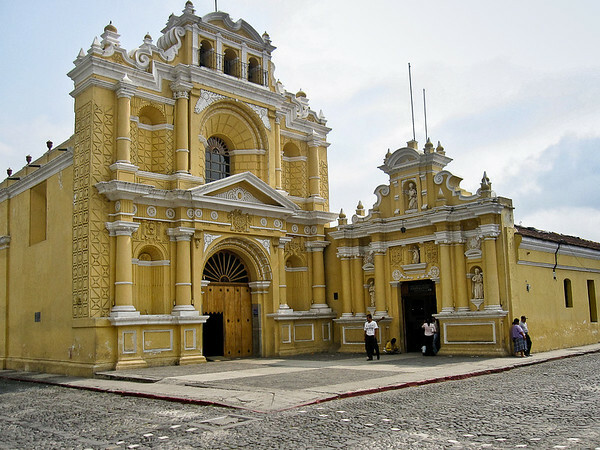 It served as the capital for the Spanish colonial government in Central America. After several earthquakes in the 18th century, the seat of government was moved to a safer place. The name Antigua dates from this period and refers to the Old one. In its years as capital Antigua had a population of about 80.000 people. The catholic church, including a large number of sects, was very powerful and wealthy. This resulted in the counstruction of numerous churches and monasteries, one even more beautiful than the other. In my opinion, Antigua is the place-to-be in Guatemala. Cobbled streets, old churches (don not miss the yellow monster!) and a lot of remains from colonial times. Guatemala on the whole is one of my favorite countries in Central America, and Antigua specifically just oozes charm. This entire 16th century colonial city is the UNESCO site, and it means that no matter where you wander, there are interesting buildings and facets of Guatemalan culture to uncover. The city has done well preserving the older buildings in recent years. So would say to the point that it's been Disney-ified, but I don't think that's a fair assessment. Yes, it's touristy and the buildings are painted a rainbow array of hues straight from a box of Crayola crayons, but it's also just lovely. Keeping things nice doesn't mean inauthentic, and for that reason I enjoyed how charming it felt to wander the low-slung town and cobbled streets. A highlight of the town is that there are a good number of things to do nearby, including volcanoes (which you can see from town), and numerous historic churches. I had the pleasure of visiting during Holy Week, Semana Santa, and the Easter celebrations in Antigua were unparalleled anywhere else (even in Spain, I reckon). The city is known for its elaborate carpets that last for just a night before the Semana Santa processions destroy them. I loved seeing the town come alive with locals for the holiday, and the deep religion here is also a part of what enlisted Antigua on the UNESCO list, so at no other point in the year can you so palpably feel the long religious history than during the elaborate Semana Santa celebrations. It's a photogenic city, so keep your camera handy as you explore, and you should surely give yourself a few days to properly enjoy Antigua's charms. Went to Antigua in Nov. 2010. Wonderful small town, cobblestone streets, marketplace, old church, and views of active volcanoes. Don't miss the jade museum--fascinating history of how they rediscovered jade mines after thousands of years. 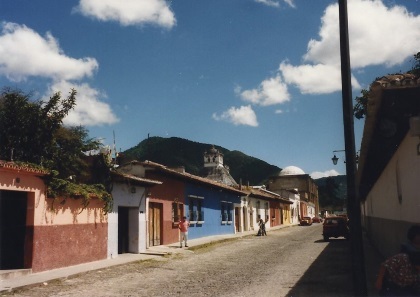 My wife and I spent 10 days in Guatemala in March 2007, including 6 days in Antigua. We'd both go back today if we could. It is without a doubt our favorite place to go. We felt safe walking around town almost any time of day and even into the evening. The weather seems to always be just perfect. When you go, be sure to eat at least one meal at El Mediterraneo - just a block off the square. Plan on taking tons of pictures. Between Antigua, Lake Atitlan, and Tikal we took over 700 photos. We're planning another trip for next spring and have even talked about retiring their someday - something I would have never imagined 2 years ago. I was in Antigua in January, 2005 for a wedding. I must say that I considered buying a house and staying. Absolutely beautiful. The people are very warm and the coffee is great. I walked all over the town night and day and I can't wait to get back and sit in the courtyard in the center of town and just be. Perhaps I'll retire there, and die there. It's funny, because I'm Plains Indian, and I really dug the whole Mayan thing. I appreciate their resistance. They've been doing it longer than we Plains People. I think the Mission Valley in Montana is the most beautiful place on Earth, but Antigua is definitly a tie, definitely a very attractive place to be despite the tourists and the ruling elite. Past reviewers have mentioned the language schools in Antigua. I studied for 2 weeks at Proyecto Linguistico Francisco Marroquin, which I highly recommend. Having only had an introductory course in Spanish in the 8th grade, I was a bit intimidated my first day of classes but by the end of my stay, I was giving people directions in the city! (Okay, it also helped that I was fluent in Tagalog and that many people would mistake me for a local). I also stayed with a host family who were so kind and hospitable. I still keep in touch with them today. 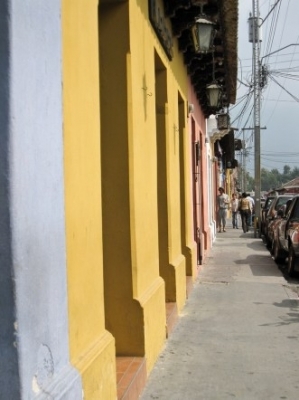 Places in Antigua to explore include La Merced church ("the yellow monster," as someone called it) and Casa Popenoe. second trip to Antigua and the first for my wife and daughter and I knew they would love it. It is a great place to visit, lots of culture, excellent food and beautiful vistas. quite as developed....I would recommend it too. 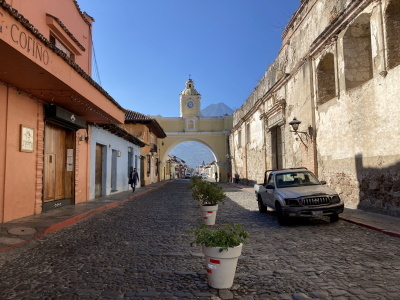 Antigua Guatemala is the antidote to Guatemala City. Unless you really need to, don’t even think of staying in the capital! The drive to/from the airport is hardly any longer from Antigua than from the capital and taxis/buses ply the route if you don’t have your own transport. If you want to visit the capital it is 45 minutes away. Antigua has become a major centre for Spanish Language Schools and receives a lot of tourists, mainly from the US but on the whole is not overwhelmed by them. Its location, overlooked by a volcano, is superb and its relatively small size means that it is easily accessible on foot. Its climate is pleasant, its hotels and restaurants cater for every taste and budget. The town doesn’t contain any buildings of “world class”, but its inscription as a WHS reflects the totality of its colonial heritage and the atmosphere it generates - the nearest comparison on the American continent I can identify would be Ouro Preto in Brazil. Antigua was a fascinating city full of some of the happiest and friendliest people I have ever met. I went down for 2 weeks for a missions trip and recommend visiting Antigua to anyone who visits Guatemala. Antigua is a truly beautiful city which is nestled in the mountains and volcanoes of a beautiful country. I have visited Antigua twice during Semana Santa (Holy week) during the last year and a half and it was very enlightening to observe the cultures of a foreign world. During my trips to Guatemala I ventured to San Andres, Sajcabaja to stay at the Home of Life and Nutrition Orphanage which is approximately 6 hours north of Antigua. I and a team of 20 other individuals spent the week ministering to the surrounding Aldeas and caring for the orphaned children. My experiences here were life changing and I am looking forward to returning in the near future. Guatemala and its people are a must see. This is one of the most beautiful cities in Central America. I would recommend it to anyone going to Guatemala. I was in Antigua back in july 2002 on a missions trip. The people there were very friendly and the food was absolutely great. I would love to go back there again... there are so many people in need.